Cookouts, barbecues, family reunions and more are upon us, and as the coolest neighbor on the cul-de-sac, hosting is a no-brainer. We’ve compiled three simple ways to get your deck and yard ready to go, so you can play host to the cookout of the year. After you remove the leaves from the surface of your deck or patio, dirt and stains remain. 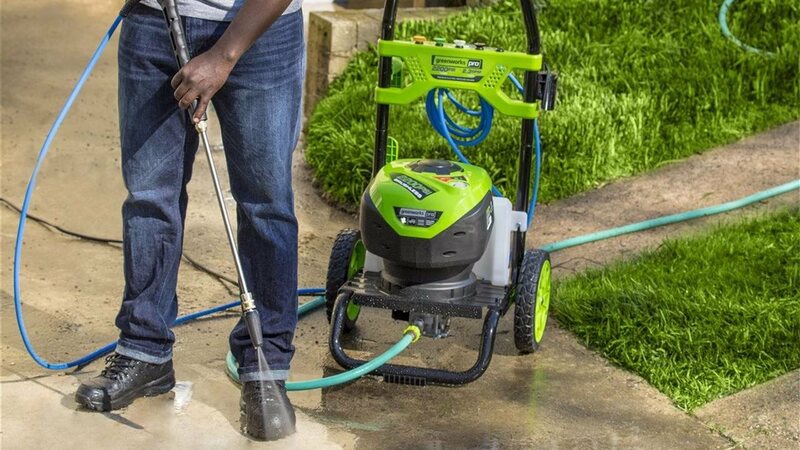 Luckily, Greenworks Tools has released the easy-to-use 2000psi Pressure Washer. This light, powerful and gas-free machine will ensure that you have an easy time making your deck or patio look brand-new, impressing your guests. Talk about a win-win situation. A great cookout on the deck is never a reason to complain, but taking your deck to the next level visually will enhance the experience a hundredfold. Consider outdoor string lights to hang across the deck, instead of relying on porch lights, to set the party mood. This is also a wonderful time to invest in new lawn and deck furniture if your current set is beginning to show its age. While the barbecue may not leave the deck, your guests should be impressed with the high-quality mowing lines and perfectly trimmed hedges in your backyard. To make the job easier and save you time, Greenworks Tools has you covered once more. A complete lineup of lithium-ion battery-powered outdoor equipment eliminates the mess, hassle and noise of gas-powered tools without having to sacrifice any of the power to get the job done, ensuring that your yard will be the talk of the party. For more information, visit http://www.greenworkstools.com.